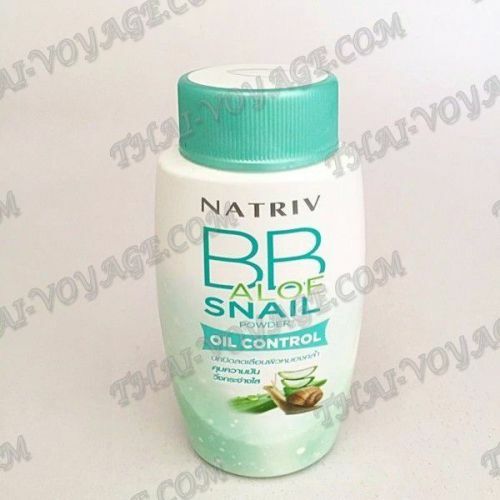 Snail powder BB to eliminate excessive fat content of the skin, containing in the composition of snail filtrate and aloe Vera for care, nutrition and beauty of the skin. Loose snail powder BB falls evenly on the skin and does not clog pores. Smoothes the skin, evens the complexion and has a pleasant floral aroma. BB powder contains herbal extracts of aloe Vera, bearberry and licorice plus snail filtrate, which relieve irritation and inflammation on the skin, moisturize and nourish the skin and promote healing of small wounds and acne. Loose snail powder BB has a light beige color and contains a delicate amount of flickering particles, and after applying the powder, even dull, tired skin looks radiant and smooth. Application: a small amount of powder to pour into the palm, sponge or brush to apply a thin layer to the face.